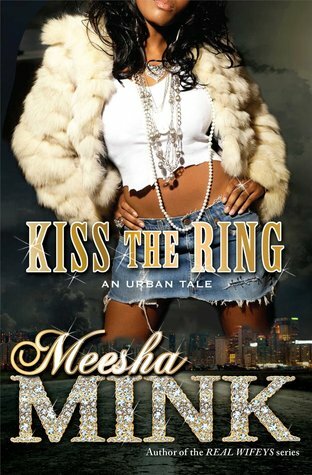 Kiss the Ring by Meesha Mink is a story about guilt, regret and street justice. Naeema is out to seek revenge against those responsible for the death of her son, and she will stop at nothing to do it. Naeema didn’t have a great childhood, so it wasn’t a surprise that she didn’t or wasn’t able to provide a better life to her newborn baby when she became a 16-year-old mom. After she leaves her baby in the care of a woman she trusts, Naeema sets back out in the streets, never getting to raise, or even know, her son, Brandon. Years later, at age 14, Brandon goes down the same path as his mother and is murdered. Wrecked by her guilt and regret, Naeema becomes Queen and infiltrates the dark world and crew her son was involved in to find out who killed her son and get revenge. I thought this book was decent. I hadn’t read anything by this author before, and I do like discovering new authors and trying different books. One thing I liked about this book is the relationship between Naeema and Tank. I thought the ending would be different between them, or at least I wished it were different. Also, I think readers will like Sarge, as he was my favorite character in this book, despite him being only a minor character. In short, street lit fans will like this book. It’s kinda sad, but I liked reading how Naeema accepted her absence in her son’s life and the consequence of that action.